I spent this weekend playing two games that offer incredibly different takes on remarkably similar ideas. The first of them was Diablo 3 - I picked it up cheap in a PS Store sale, because I was feeling lazy and I wanted to murder a whole bunch of things. The second was The Elder Scrolls: Blades, which I finally got onto the early access program for. 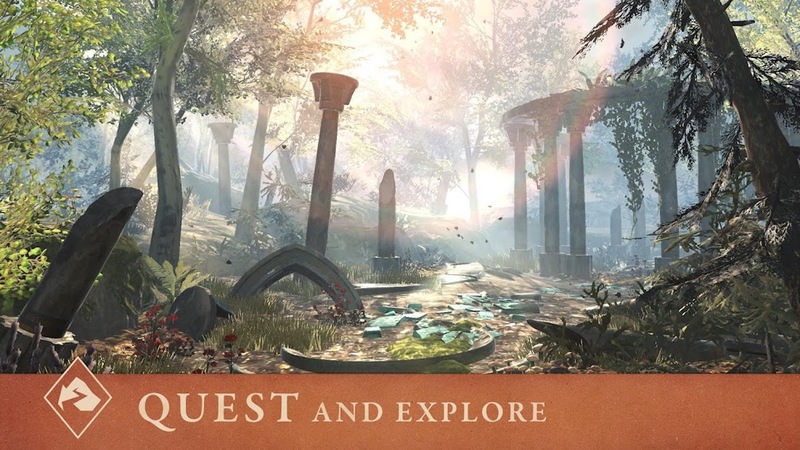 We'll start things off with a proviso - The Elder Scrolls: Blades isn't a finished game yet, that's the whole point of an early access release, so hopefully plenty of the observations I make here are going to be rectified before everyone gets their hands on the game in the not-too-distant future. What struck me most about the two games is how they handle compulsion - in a way, Diablo 3 feels more like a mobile game than Blades, because it understands how to keep you engaged long after the mechanical nature of the experience has started to wear thin. Playing Diablo on Normal Mode essentially involves pressing attack buttons until everything on the screen that isn't you is dead. Then you'll get some new gear, equip it, and watch your numbers go up. It's those numbers that are key, and they can save a game from itself - look at Destiny. Diablo and other games of its ilk understand that little victories deserve rewards - it's rare that you'll finish a dungeon wearing the same clothes or wielding the same weapons as when you started. Everything else is window-dressing, because the game knows you're going to be focusing on those stats. Now obviously, The Elder Scrolls: Blades has a different lineage - it's a less action-focused series, with a core of exploring massive worlds, and character progression that's based not just on how you want to be able to kill things. But that history doesn't really make it into Blades - there's a world mentioned, but for the most part you're straight into a dungeon when you accept a quest. I've got no problem with that, in principal, but Blades falters when you step into those subterranean lairs. The combat isn't bad, the movement isn't bad, it even looks quite nice, but from the get-go you're grinding. Diablo masks that grind with progression, with shiny new weapons and extra skills, with new monsters to fight, new secrets to uncover, and all sorts of violence to release on anything that looks at you funny. Blades, on the other hand, trudges at the same pace as its predecessors, but doesn't give you any of the things that made that trudge bearable. There's no brilliant narrative, not many interesting characters, and nowhere in particular for you to go. The simple nature of the combat isn't balanced out with progression - your numbers, alas, take a long time to go up. There is a game we could compare it to that's already out on mobile - Infinity Blade. The mechanics in both games are pretty similar, but Infinity Blade uses your weaknesses to push you deeper into the experience - you die, you come back with better gear that's going to make the start of the dungeon easier. Death isn't an annoyance, and the repetitive nature of the game is obscured behind it - if you had to start Infinity Blade off all over again when you died, it'd be pretty dull. The Elder Scrolls: Blades isn't a bad game, but right now it feels like it's only got half of the mobile puzzle solved. It's got the chests and the currencies, it's got the short play time, and it's even got town-building thrown in for good measure, but it's still clinging on to the idea that depth comes from size, not from change. In trying to please both sides of its audience - Elder Scrolls fans and more traditional mobile gamers - it's going to end up disappointing them all. This is a game that needs to make you feel like every step is worthwhile, but right now it's sometimes like you're caught in a time-loop, killing the same things over and over again but never getting stronger in any meaningful way. Right now, The Elder Scrolls: Blades is fine, but fine just isn't going to cut it on the App Store or Google Play Store, especially not with that big a license behind it. There's hope though - the game needs to find the right rhythm to keep you playing, and that all starts with getting those numbers stuck deep in your brain.